Fig. 3.6. The development time for granary weevil eggs, larvae and pupae at different temperatures. The form is basically the same for all insects and mites. Temperatures and time factors are different. It is old knowledge that flies in the kitchen like to sit on a warm stove. House flies prefer to sit on objects and surfaces where the temperature is about 35 ° C. All insects will, if they have the opportunity to choose, seek out a particular temperature zone. The preferred temperature will normally be the one, which speeds up insect development. However, this is not the temperature zone in which the insects live the longest. Animals do not make the competition by getting very old, but by as soon as possible putting as much possible offspring into the world. The temperature that any species will choose reflects the adaptation to the environment the insect originally belongs in. The insects that can only develop at temperatures that are higher than those we have outdoors in this country are imported from warmer climates. This applies to many food pests. Birds and mammals are not really temperature dependent. They maintain a constant inner temperature. When the external environment is cold, their metabolisms are correspondingly higher. It is one of the reasons poisons have stronger effects on animals when it is cold. It is just opposite with insects and mites. When it comes to the possibilities of survival and reproduction, insect and mite temperature reactions are divided into the categories too cold, suitable or too hot. Too cold. Some storage mites are active and can reproduce at 4 ° C.
Insects in food require more heat to reproduce. As a rule of thumb, you can count on not being bothered by storage insects if the temperature of goods and premises is kept below 10 – 12 ° C. If the temperature is lowered, the insects become slow and finally freeze in movement. The phases meant for overwintering, wake up when it gets warm again. The other phases die after freezing for some time. Insects and mites contain water. Therefore, one might expect that a mild frost would cause the death of insect due to internal icing. However, insects tolerate freezing to some extent, which means that the icing appears somewhere well under 0 ° C.
Suitable temperature. 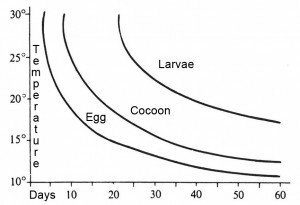 In a relatively long and coherent temperature range, insects will live and reproduce when the rest of their life conditions are met. The preferred temperature and the temperature at which the rate of development is the highest, usually is in the warmest part of this area. In experiments in which only the temperature is varied, it appears that an insect species development time multiplied by the temperature, i.e. heat sum is almost constant. Too hot. Insects normally do not survive temperatures that are more than five degrees above the highest of the temperatures at which they can reproduce. The hovering question is how long this temperature must be kept within products to make sure insect population in a product is eradicated. It may be a matter of days or weeks as there may be a wide variation in what individual insects and insect phases tolerate. Usually, we aim to heat the insects so much that the spread in their warm mortality is at a minimum. Similar arguments apply when you want to kill insects with cold treatment. It has been proved in practice that heating to 55 ° C dry heat is sufficient to kill all kinds of food pests.